On our last trip to Virginia Canyon, we ran into a group of students from the Athenian School, a high school in the Bay Area. They were on a 26-day backpacking trip as part of a graduation requirement from the school...and we enjoyed chatting with them. Nice kids, having fun. But one thing struck us as a bit odd. We met at the junction where the Pacific Crest Trail fords Return Creek in Virginia Canyon, and as we hopped on the rocks across the creek, we noticed that the kids in the group were all sitting down, with their boots off, and wringing the water out of their socks. When we asked about it, the bright young woman who was guiding them explained that "We don't rock hop across streams." We stopped there and pumped some water for the hike up to McCabe Lakes, and as we were finishing up, M noticed that their group was getting ready to hit the trail. No worries. Those young people were going to leave first, and were certainly going to hike uphill faster than us old folks. Not so. In less than 100 yards we were right behind them, and they kindly let us go ahead. And fifty yards beyond that we came to the ford of McCabe Creek...which we rock-hopped across, and headed up the hill. And we couldn't help thinking that they were going to stop after that one, sit down, take their boots off, and wring their socks out again. 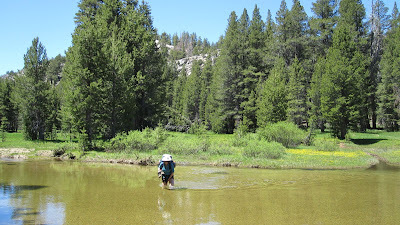 Seemed like a slow way to hike in the Sierra. Then again, the next day M was carelessly rock-hopping across a small stream, slipped, and dunked her feet nicely into the water. She grimaced, swore, and then hiked up out of the stream and let her feet dry out, more or less, on the trail. That afternoon she set her boots in the sun and completed the drying process. On the other hand, where there are no rocks, we just take off our boots and wade in our Crocs.